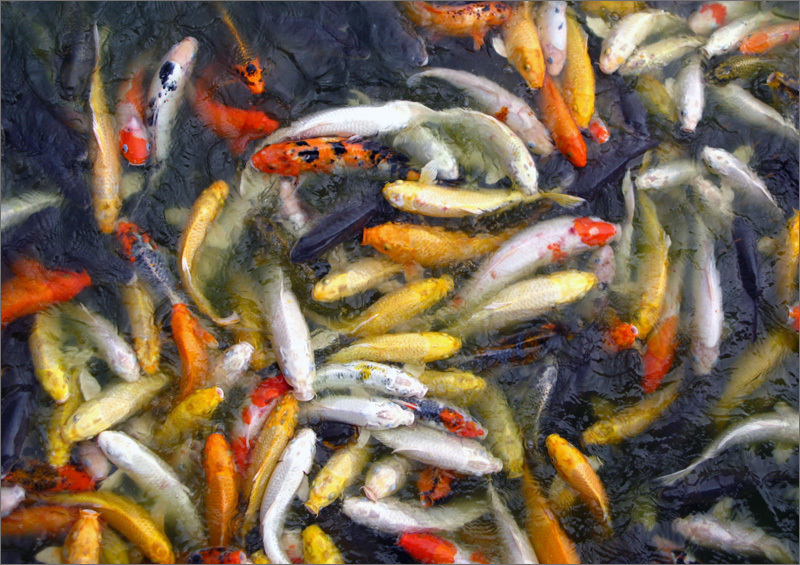 Koi or more specifically nishikigoi , are ornamental domesticated varieties of the common carp (Cyprinus carpio) that are kept for decorative purposes in outdoor koi ponds or water gardens. They are also called Japanese carp. Koi are among the longest-living vertebrates, with some animals living over 200 years. The most popular category of koi is the Gosanke, which is made up of the Kohaku, Taisho Sanshoku, and Showa Sanshoku varieties. Excellent. It's not only a picture, but a great impressionist painting, like the bests from Raoul Dufy. A very colorful capture of these fish living together in such a crowded manner. Nice effect and an interesting presentation with a nice story at your notes. A pile of carp, already know - snack time! A beautiful and colorful shot of these amazing ornamental common crap! !for me its astonishing..!well captured and an exotic one. Very beautiful painting you achieved here. mpressionism as R. said. Compacted and full colourful image.Nice composition to form this powerful image MF. Great focus and splendid vivid colours. Very well done. Have a nice W/E. A lot of fish. Amazing cut, superb exposure and capture. ideal contrast and sharpness. Fine colourful composition. Very interesting and decorative in that the image looks like so many brush strokes on a painters canvas.Great job with colors and composition.All the best,Otto.